Aluminum bleachers that are custom built for your location are sometimes the best option to maximize capacity and the spectator experience. Customized, venue specific, configurations for aluminum bleachers become a necessity because of many factors, including space restrictions, bleacher component needs, compliance situations, spectator needs and expectations. Or a change might be required simply due to the types of events that the venue will be hosting. 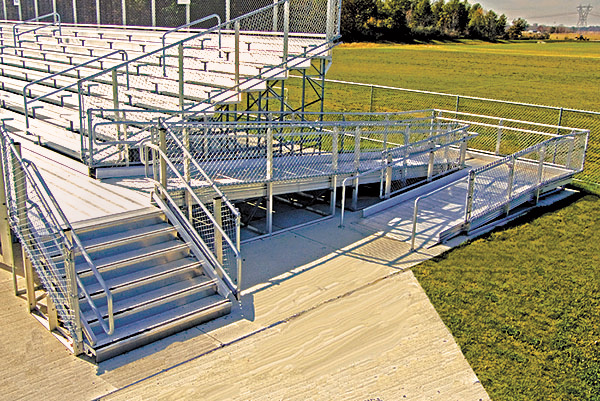 The fact is, that in almost 20% of cases, standard aluminum bleachers may not be the perfect or even the proper fit for your mass seating needs. But it is your responsibility to always provide a safe, code-compliant place for patrons to sit and enjoy themselves while at your venue for events and activities. The type of venue in which they will be installed, such as indoors or out, sport specific or multi-use, and if they will be used in seasonal situations or for year-round activities. How much foot traffic and physical abuse will your aluminum bleachers encounter? The type of environment they will be used in, including exposure to extreme weather situations like excessive wind, snow, rain, saltwater air, as well as the amount of exposure to the sun (UV rays) and pollution. The general demographics of the visitors that you will be hosting, regarding age groups, physical ability, and any prevalent special needs, can all play a part, either individually or in unison, in how you want your bleachers to be configured, constructed, and installed. These types of questions will allow you to order custom aluminum bleachers so that they are safe, useful, and enjoyed throughout their lifespan. ADA specifications: Accessibility for all spectators is important, and your code compliant aluminum bleachers should offer proper ADA accessible amenities so that all of your visitors can enjoy the game. The Americans with Disabilities Act (ADA) is a federal law, laying out the groundwork and some of the specifics about what you need to be code compliant. Some of these mandated amenities can be customized and subsequently permitted depending on your specific installation and the inspection process. ADA customization may include the installation of ramps, guards, and wheelchair spaces while also considering the location, access to, and sightlines of those spaces. Specific Site Dimensions: Fields and venues are obviously not all the same. When replacing or retrofitting aluminum bleachers, your available space may not fit the standard as defined in today’s market. Aluminum bleachers can then be custom manufactured to provide a code compliant, professionally designed place for your visitors to enjoy the action. Customized bleachers will be safer, easier to use, easier to maintain, and more enjoyable for all involved. The number of seats and rows needed: While browsing the standard aluminum bleachers configurations that are offered, you may notice that the standard rows and seats per row offered aren’t a great fit for what you need. Customizing your bleacher capacity can give you the extra space and additional seating availability to fit your needs and budget. Different sizes or lengths of aluminum bleachers are desired: Bleacher models and designs are offered in lengths up to 27 feet. If the offered bleacher models aren’t what you had in mind, or would surpass the 27-foot limitation, customized aluminum bleachers can be manufactured to fit your situation. Non-standard decking or seating is desired: Standard bleachers offer decking that is constructed so that surfaces above 30 inches from grade level contain guards that will not allow a 4-inch sphere to pass through. Should you want decking that is closed completely, customized, interlocking decking is the answer. Closed decking offers no openings, making cleanup much easier. Any trash and litter will stay on the decking surface, ready for easy cleanup versus climbing under the bleachers to retrieve trash. Additionally, adding backrests for support and extra comfort, or upgrading to chairs rather than seating planks can customize your standard bleacher seating. This is possible even when used in limited or specially designated areas. Existing structure integration: You may already have existing press boxes or band, cheer, and stage platforms that you wish to integrate with your new bleachers. Customized aluminum bleachers can be installed so as to offer safe, code compliant access and seamless structural integration to those amenities that will remain on site. Vomitory requirements: Despite the crude name, a vomitorium is simply the entrance or exit piercing a bank of seats in an auditorium, stadium, or venue that shows people where to enter or exit. The required number and placement of vomitories, as well as other specifics on required egress needs are outlined in Chapter 4 of the 2012 ICC Standard on Bleachers, Folding and Telescopic Seating, and Grandstands. Non-standard bleacher color and cover choices: You want your bleachers to reflect that it’s your home field. What better way than to make your aluminum bleachers pop with the addition of colors taken right from the home team’s color palette. You have two options to add a unique splash of color to your bleacher seating. Aluminum bleachers can be powder coated in your choice of color to make your venue unique or to distinguish specific areas of the bleachers. Press boxes, bandstands, or even VIP seating can be made special by the use of color in their assigned areas. Alternately, bleacher covers are great ways to add color and warmth, if needed, directly in the areas that you want to distinguish. Both options are available in standard or custom colors to match your team, business, or organizational colors. Aluminum bleachers are the safest, most economical way to provide mass seating in the precise locations where you need it. They can be permanently installed, added temporarily for needed seating, or made to be portable (tip and roll) so that they can be moved around to different locations as needed. The models and packages that are displayed in catalogs are considered standard, but are by no means your only choice. Bleacher models and styles all have their own seating planks, handrails, guardrails, and footboards. And as different as the bleacher models may be, they also have their own specific requirements when it comes to code and safety regulations. Customizing an aluminum bleacher package to fit your unique needs is the best way to end up with a safe, code compliant, quality manufactured, and professionally installed product that you will use and successfully maintain for many years and activities to come. 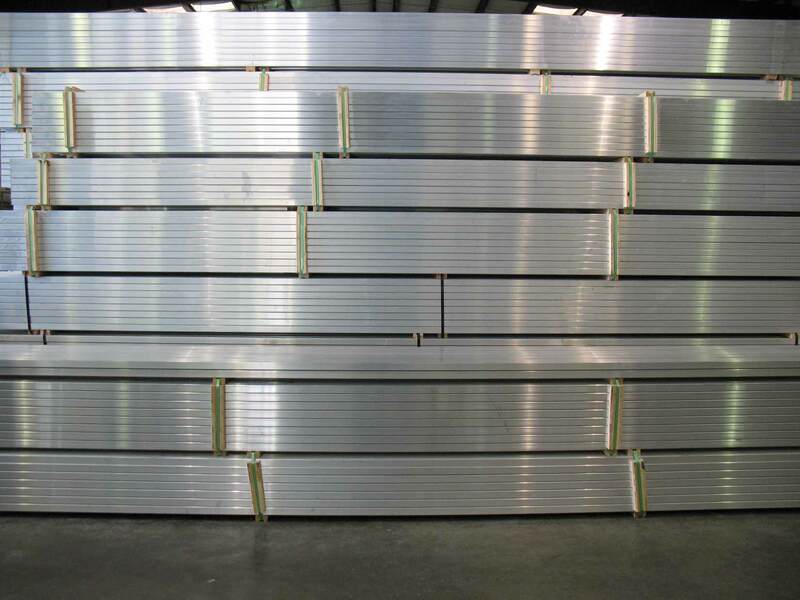 Additionally, by installing aluminum bleachers that are custom designed for your venue, you have gone an extra step in protecting yourself from possible lawsuits that may occur over a one-size-fits-all installation. So instead of settling for bleachers that are only a “pretty good” fit for your venue, insist on customizing your aluminum bleachers for peak performance, years of reliable usefulness, and unmatched spectator satisfaction. Aluminumbleachers.com offers free custom seating layouts for custom projects.